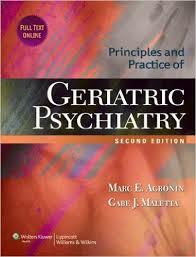 There is a critical shortage of access to care for geriatric psych patients in the U.S. that is only surpassed by the shrinking size of the pool of geriatric specialists. The American Association for Geriatric Psychiatry has seen a decrease in the number of members over the past five years due, primarily, to a higher level of retiring providers vs. geriatric specialists entering the workforce. Geriatric fellowships number about 46 nationwide, each turning out one specialist per year, and only two new fellowships are being launched in the near term. Current rates will result in a continuously-shrinking workforce between now and 2022, just when the geriatric population of boomers begins to swell the patient ranks. In 2010, President Obama signed in to law the “Patient Protection and Affordable Care Act,” intended to address the grim future for geriatric patients by authorizing two studies of the issue by the Department of Health and Human Services and the Government Accountability Office. • Financial Disincentives – inadequate Medicare compensation is putting many geriatric practices out of business. 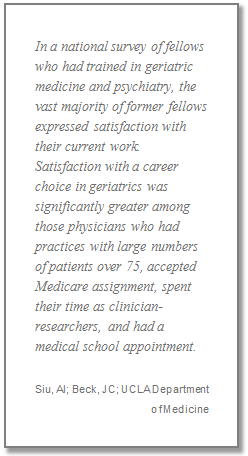 The most surprising fact related to the case is the high satisfaction level of physicians working in the geriatric space! 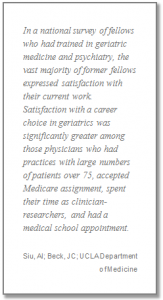 A study by the UC Davis School of Medicine discovered “that geriatric physicians were more likely to have very high career satisfaction than 32 other specialties” (Archives of Internal Medicine). We represent the established leader in geriatric care in the northeast and a new paradigm (care model) that addresses many of the aforementioned challenges. Improving quality of care requires a vocational commitment to geriatrics from top to bottom in the organization and a commitment to specialization. Our emerging geriatric brain trust involves multi-disciplinary teams of psychiatrists, psychiatric mental health nurse practitioners, psychologists, and family nurse practitioners led by an administrative and executive team that has mastered the space, including billing and reimbursement. We focus on back office, our providers focus on what they do best – patient care. We are experiencing 400% growth in evidence that we have created a facilitating environment for change and are at the transformative learning stage in the paradigm shift. Why not join a winning team?